Prior to Göbekli Tepe it was assumed , that Sumerian society was the first advanced civilisation. 6,000 years before the invention of writing neolithic cultures carved intricate designs, sigils and images in stone, most of which concern themselves with farming and fertility. But Stone tools did not carve these reliefs. 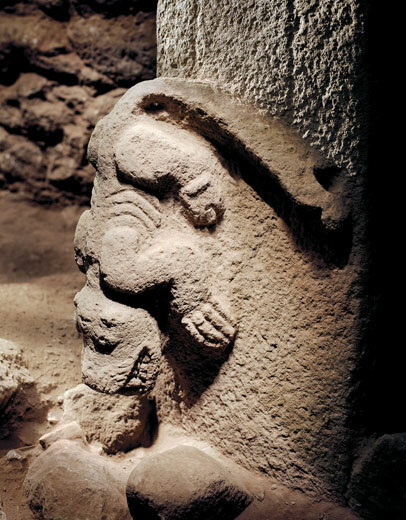 Gobekli Tepe’s pillar carvings however are dominated not by edible prey like deer and cattle but by predators like lions, spiders, snakes and scorpions. Some cultures have long believed that high-flying carrion birds transported the flesh of the dead up to the heavens indicating a concern of an afterlife. But the temples’ true purpose lays beneath the half buried pillars and yet to be excavated by archaeologists and anthropologists. 11,000 years old, crafted and arranged by prehistoric people who had not yet developed metal tools or even pottery. Each ring has a roughly similar layout: in the center are two large stone T-shaped pillars encircled by slightly smaller stones facing inward. The tallest pillars tower 16 feet and weigh between seven and ten tons. Some are blank, while others are elaborately carved: foxes, lions, scorpions and vultures abound, twisting and crawling on the pillars’ broad sides. 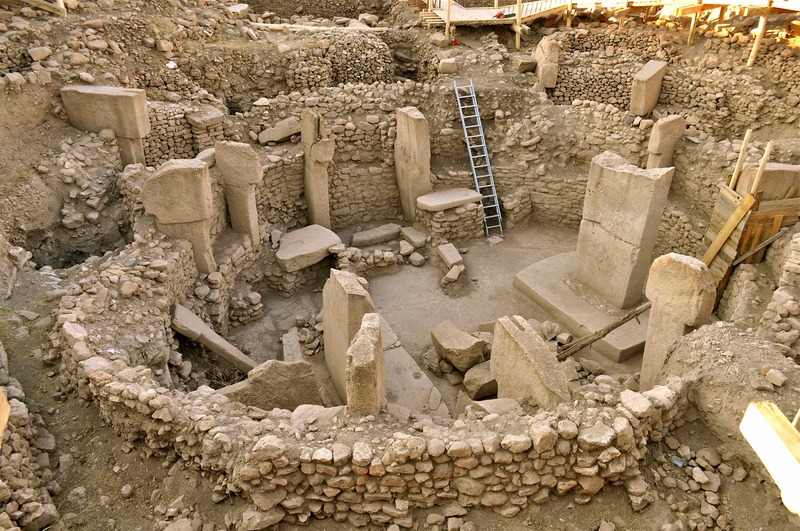 Gobekli Tepe sits at the northern edge of the Fertile Crescent—an arc of mild climate and arable land from the Persian Gulf to present-day Lebanon, Israel, Jordan and Egypt—and would have attracted hunter-gatherers from Africa and the Levant. 16 other megalith rings remain buried across 22 acres archaeologists could dig here for another 50 years and barely scratch the surface. This area is the real origin of complex Neolithic societies. In constructing the temple, once the stone rings were finished, the ancient builders covered them over with dirt. Eventually, they placed another ring nearby or on top of the old one. Over centuries, these layers created the hilltop. examined at the site are more than 100,000 bone fragments from Gobekli Tepe, often found with cut marks and splintered edges on them, indicative of the butchering and cooking of these animals. Found were Gazelle bones, and other wild game such as boar, sheep and red deer. Also discovered were bones of a dozen different bird species, including vultures, cranes, ducks and geese. The abundance of wild game remains is a clear indication that the people who lived here had not managed farms or domesticated animals. A situation that was about to change. how they lived. this was the discovery that the environment which they had settled held the raw materials for farming. Including wild sheep, wild grains that could be domesticated. 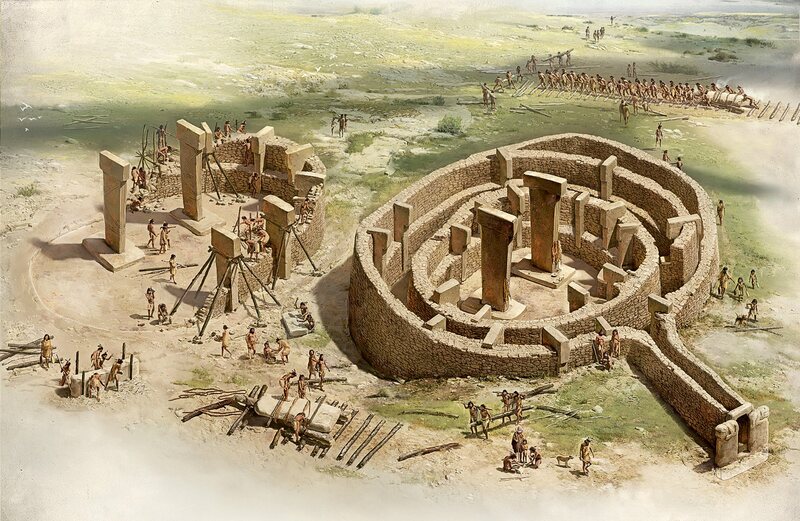 Research at other sites in the region has shown that within 1,000 years of Gobekli Tepe’s construction, settlers had corralled sheep, cattle and pigs. And, at a prehistoric village just 20 miles away, geneticists found evidence of the world’s oldest domesticated strains of wheat; radiocarbon dating indicates agriculture developed there around 10,500 years ago, five centuries after Gobekli Tepe’s construction. and housed. Hence the eventual emergence of settled communities in the area around 10,000 years ago. Prior to the discovery of 20 possible writing symbols on the pillars of the temple, it was believed that the first written language was ascribed to the ancient Sumerians in perhaps 3200 BCE. Göbekli Tepe moves this back to at least 10,000 BCE. signs of a very high level of cooperation spanning almost 3000 years at Göbekli Tepe. It was also believed that the discovery of the wheel did not surface until 3000 BCE in Sumeria, again Tepe contadicts this with evidence of roads that show tracks formed in what was mud and limestone over 100s if not 1000s of years. Interestingly, 60 miles northeast of Göbekli Tepe at Karaca Dağgrows grows the closest known ancestor of Einkorn Wheat. This strain has been domesticated and dates back to about the time this site was in peak use. there is also the earliest evidence of bread-making and beer making. Prior to this beer-brewing in vats was believed to have started in China about 5000 BCE. 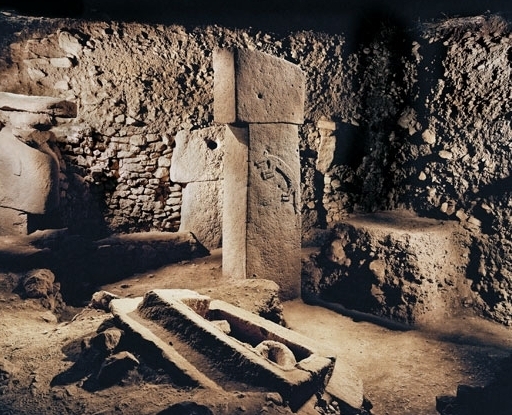 The most perplexing anomaly that Göbekli Tepe presents is not only just how sophisticated and organised a culture had to be to build and operate such a complex, that all evidence indicates was free of conflict for 3000 years, but what would convince this culture to bury it. What is even more fascinating is the fact that the technology had to have already existed and the mechanical aptitude in place well in advance of the temple’s initial construction. this article was made possible by the research of Professor Klaus Schmidt, the chief Researcher and Archeologist on site. Professor Schmidt recognised the significance of the site after it was largely dismissed by University of Chicago and Istanbul University anthropologists in the 1960s.